Parrots and other pet birds come in pretty much every color of the rainbow, but some who are looking to adopt a new pet bird might be interested in trying to find a very brightly colored feathered friend. If that sounds like you, then you've come to the right place. This list reviews the top 5 most brightly colored pet bird species and will give you some great ideas regarding the prettiest and brightest birds in the realm of pet bird species. Check it out and see for yourself—these beautiful birds and their eye-catching plumage will impress you. When it comes to brightly colored pet birds, it would be an atrocity not to put Sun Conures at the top of the list. These beautiful medium-sized parrots combine a rainbow of colors all in one exceptionally gorgeous bird. As adults, these birds sport a mixture of red, yellow, and orange on their heads, while their bodies display bursts of brilliant green, yellow, blue, olive green, and sometimes even deep violet markings on the plumage of their tails. You truly have to see one in person to appreciate how beautiful they really are -- photos just don't seem to do them justice. 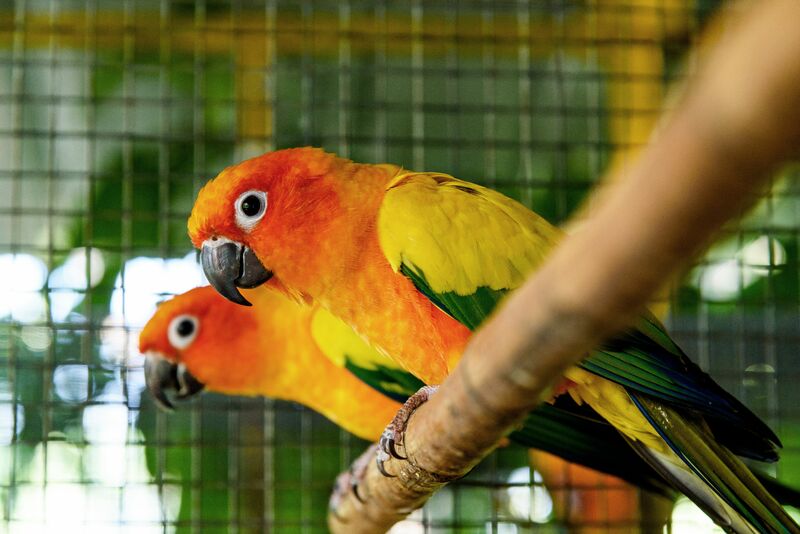 If you'd like to meet a Sun Conure to see for yourself, try contacting your local aviculture society or a breeder to observe and interact with some of their birds. A close second to Sun Conures in terms of color, size, personality, and much more are the Jenday Conures. Also hailing from South America, Jenday Conures are often mistaken for young Sun Conures when they are in fact fully grown and mature adults. They have yellow heads with bright red patches on their cheeks, greenbacks accented with bright blue flight feathers, yellow, red, and orange bellies that seem to have a beautiful fiery mixture of colors, and green tail feathers with a splash of bright blue underneath. Lorikeets, and in particular Rainbow Lorikeets are exceptionally beautiful and colorful birds who are sure to catch just about any bird lover's eye. Originating in Australia, these little beauties have brush-like structures built onto the ends of their tongues so that they can more easily drink nectar out of the middle of flowers—a staple of their diet. Rainbow Lorikeets have brilliant blue heads and bellies, bright, fiery orange chests, and green feathers on their wings, backs, and the backs of their heads. In addition to their beautiful plumage, they have charming personalities and make great pets for the right people. Scarlet Chested Parakeets, also commonly known as "Splendid Parakeets" are one of the families of grass parakeets and are arguably one of the most brilliantly colored ​small bird species available as pets. They are a rainbow of dark blue, sky blue, red, green, and yellow. Being a dimorphic species, the males are colored differently from the females, making it rather easy to tell the two apart based on sight alone. Use caution if you are interested in adopting one of these birds, though as they have a reputation for being harder to tame than some other types of hookbills. Eclectus Parrots are large, beautiful birds, not known for the many different colors that they have, but rather for the brilliance of the colors that they do display. Like the Scarlet Chested Parakeets, Eclectus Parrots are dimorphic, so you can tell the difference between males and females based on the colors of their feathers. Male Eclectus have bright green plumage while the females display feathers that are a brilliant red with bluish-purple accents on their chests and bellies. Highly sought, after as pets, these intelligent birds hail from Australia and have become favorites of bird lovers around the world.